Tanna of the beginning of the third century. Ishmael served as a Roman official together with Eliezer b. Simon, and was instrumental in suppressing the hordes of Jewish freebooters that had collected during the war between Severus and Rescennius Niger (193). His activity in this direction was greatly resented by the Jews, who never forgave him for handing over fellow Jews to the Roman authorities for execution (Meg. 84a). 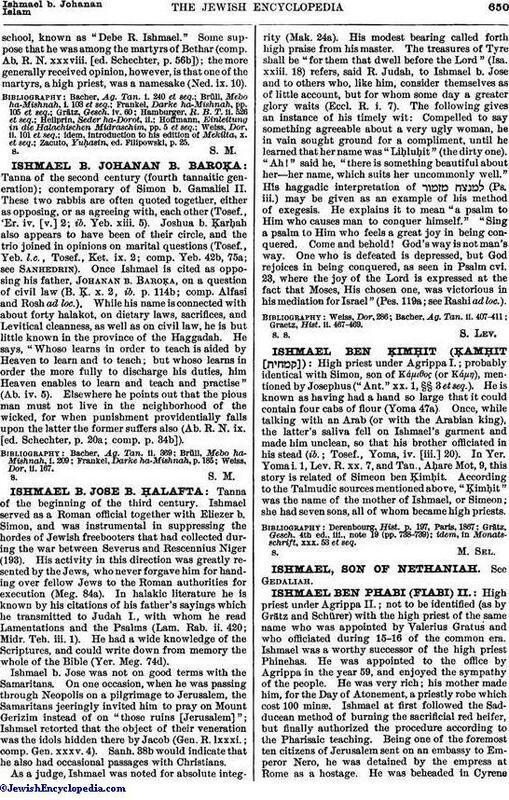 In halakic literature he is known by his citations of his father's sayings which he transmitted to Judah I., with whom he read Lamentations and the Psalms (Lam. Rab. ii. 420; Midr. Teh. iii. 1). He had a wide knowledge of the Scriptures, and could write down from memory the whole of the Bible (Yer. Meg. 74d). Ishmael b. Jose was not on good terms with the Samaritans. On one occasion, when he was passing through Neopolis on a pilgrimage to Jerusalem, the Samaritans jeeringly invited him to pray on Mount Gerizim instead of on "those ruins [Jerusalem]"; Ishmael retorted that the object of their veneration was the idols hidden there by Jacob (Gen. R. lxxxi. ; comp. Gen. xxxv. 4). Sanh. 38b would indicate that he also had occasional passages with Christians. As a judge, Ishmael was noted for absolute integrity (Mak. 24a). His modest bearing called forth high praise from his master. The treasures of Tyre shall be "for them that dwell before the Lord" (Isa. xxiii. 18) refers, said R. Judah, to Ishmael b. Jose and to others who, like him, consider themselves as of little account, but for whom some day a greater glory waits (Eccl. R. i. 7). The following gives an instance of his timely wit: Compelled to say something agreeable about a very ugly woman, he in vain sought ground for a compliment, until he learned that her name was "Liḥluḥit" (the dirty one). "Ah!" said he, "there is something beautiful about her—her name, which suits her uncommonly well." His haggadic interpretation of (Ps. iii.) may be given as an example of his method of exegesis. He explains it to mean "a psalm to Him who causes man to conquer himself." "Sing a psalm to Him who feels a great joy in being conquered. Come and behold! God's way is not man's way. One who is defeated is depressed, but God rejoices in being conquered, as seen in Psalm cvi. 23, where the joy of the Lord is expressed at the fact that Moses, His chosen one, was victorious in his mediạtion for Israel" (Pes. 119a; see Rashi ad loc. ).